The Computing Technology Industry Association (CompTIA) is on a mission to encourage girls around the world to join the tech workforce. CompTIA has a new campaign centered on inspiring girls to pursue careers in technology. With two daughters who have inherited their mom's love of all things tech and digital and social media... I am all for encouraging and inspiring girls to find an interest in technology and pursue a career they can be passionate about. I can tell you I never once even thought about going into any technology related career. It didn't even enter my mind. I'm really hoping to change that for my girls. I have to tell you, I was surprised by some of the statistics involving girls in tech. I know it's a male heavy industry... but I'm so used to heading off to parent social media conferences and events that I forget that the average tech conference really leaves women in the minority. When I've ventured out of the parenting blog and social media bubble to attend larger conferences and conventions... the number in attendance definitely shrinks. With the tech industry growing with no sign of stopping... I think it's so important to make girls aware of the opportunity. Today, 47% of middle and high school boys have considered pursuing a tech career, compared to 23% of girls. Girls' interest in tech jobs also decreases 30% after they enter high school. Some pin the tech workforce gender divide on the simple fact that women are less interested in technology than men – but we think there’s more to the story. 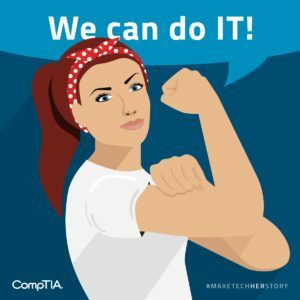 Visit www.comptia.org/MakeTechHerStory to learn more about how you can help us #MakeTechHerStory. I downloaded the #MakeTechHerStory ebook that CompTia has created and was really interested to see what their research has been finding... and how we can help inspire more girls to consider an IT career. It was particularly interesting to find that a major deterrent is the simple fact that all students (girls and boys) just don't know what IT and IT careers involve. You can't think of something IT related as your "dream job"... if you don't have a clue what types of IT jobs there are. How do you dream about a job you don't know anything about? If you have a daughter, or niece, or any girl in your life... and you think she might have an interest or excel in a career in technology... make an effort to help her learn about the IT field. While CompTIA conducted their research, and met with girls (like in the video) they learned primarily that girls just don't know what a career in technology can look like. It isn't simply "deconstructing a gender issue" that claims boys just like tech more than girls. It's making information available that just isn't. There are so many avenues to follow through tech. I think we're fortunate here in the Madison Public Schools, in that there is such a push towards technology. They have an active Technology Plan, and launched a STEM initiative (science, technology, engineering, math) in 2015. I'm especially excited about what is available to all students in the middle school (since that's where Zoe is now). I think this absolutely is a step in the right direction (for both girls and boys)... but we still need to be active, as parents, to make sure our children are aware of all of the opportunities that are available to them, now and in their futures. To support the Make Tech Her Story campaign, CompTIA has called on Rosie the Riveter, the cultural icon associated with the women who joined the workforce during World War II. But instead of working in munitions factories and shipyards, Rosie circa 2016 is building mobile apps, managing the Internet of Things and keeping cyber assets safe and secure. To help support the Make Tech Her Story campaign... click over and design your own Rosie the Riveter icon and share the mission easily share #MakeTechHerStory on Facebook, Twitter, or by downloading your image and sharing anywhere!